I have been a customer of Ohio Desk for 20 years. Obviously, they continue to meet my needs and do so with customer service being their number one priority. I just want to say that your company is very easy to work with. Outstanding results. Would highly recommend. This is the second office move that we have used Ohio Desk for. We called this time as we knew that we would get the same professional service they gave us five years ago. We have used Ohio Desk on many projects over the past few years and are always pleased with the service. Our salesperson at Ohio Desk is always professional and offers great ideas to our projects. When there are any problems with products, she gets right on things and works to meet our standards. We are very pleased with her service. This is a tough business to shine above your competition. Ohio Desk has done that for this account. Our salesperson and her support team have been great. Our company has purchased many items from Ohio Desk over the years. We have been very pleased with the quality of products and with the service of all Ohio Desk personnel. Additionally, we have moved our office with the help of Ohio Desk three times. We wouldn’t trust anyone else. The Asset Manager was extremely helpful with our most recent transaction. The Project Manager has always been organized, professional and pleasant. Our experience with Ohio Desk was extraordinary. We experienced top quality services and would go back without a question and would recommend them to anyone. Our salesperson and designer were outstanding. Early in the design stages of our college’s major renovation project, I advocated that we use Ohio Desk for the project furnishings due to your firm’s past performance and the firm’s ease of use (aka; State Term). They met with me and other members of the college on numerous occasions throughout the planning, design and construction of the project to discuss our furniture needs, goals, options and budget. They were consummate professionals. I will continue to seek Ohio Desk products and designs for future college furniture needs. Please extend my appreciation for their fine efforts. Sales, design and installation teams have displayed exceptional professionalism and high quality delivery of product. Our organization appreciates and values the responsiveness and attention given in accommodating our demanding needs. Customer service is outstanding. Response time is excellent. Ohio Desk is extremely efficient. Once a project is introduced, the best I can do is get out of the way. The partnership has been built on the basis of trust, excellent products, competitive pricing, outstanding sales support, service support and administrative support by your team. I needed help managing our FF&E assets and facilities, as it is only one of numerous functions I perform for the corporation. Ohio Desk came up with a solution which has worked beautifully. Saves me a lot of time and money, as we didn’t need to hire another person. Our salesperson’s consistent, energetic approach to every project no matter how small, keeps me coming back to Ohio Desk. Without a doubt, your company is a leader in the furniture industry and the system you have in place from start to finish could easily be used as a model for other customer service related companies striving for excellence. We have been using Ohio Desk for about a year now. I’ve been in healthcare materials management for nearly 15 years and have never found a rep as competent and thorough as our salesperson, nor have I found an office equipment company that seemingly provides such a high level of support to their sales team. Whatever you folks are doing – I applaud you. Keep up the good work. I have worked closely with our salesperson and project manager for years. They are the most efficient, responsive and easy-going (with all the changes that occur) I have ever worked with. They are true professionals, they know the College, they know their product, and they follow through on each and every item they are responsible for. They even follow through and “fix” things that they are not responsible for. They epitomize customer service. Our salesperson is an exceptional and talented employee. I cannot imagine how she maintains her energy level, enthusiasm and efficiency in the manner that she does. She is a gem, and I hope you appreciate her to the extent that you should. She IS Ohio Desk to me. She represents you extraordinarily well. I have worked another dealer over the years. There is no comparison. Ohio Desk has the best customer service of any vendor. Specs/quotes are quickly provided, deliveries are easy to schedule, installs typically go smoothly and follow-up issues are handled. Also appreciate that evaluation chairs are usually available when needed. Ohio Desk provides quality service through quality people. Our salesperson is the most outstanding asset Ohio Desk has. She is excellent – intuitive, organized, efficient, accommodating and is the model of customer service. Her product team is also excellent, they know their job and their installations are nearly flawless. If there is a flaw, it is not on their end. The team I work with at Ohio Desk is always helpful and quick to respond to our requests. Ohio Desk has done an excellent job serving our needs and those of my clients especially since I am new to administrative space projects and need all the help I can get. Ohio Desk is first class, responsive, honest and professional at all levels. I appreciate doing business with them every time! I have more “average” experiences with others I purchase from. The Ohio Desk staff I have worked with are the service department and our salesperson. Each has been consistently helpful in the different information and services they have provided for my department and me over the years. 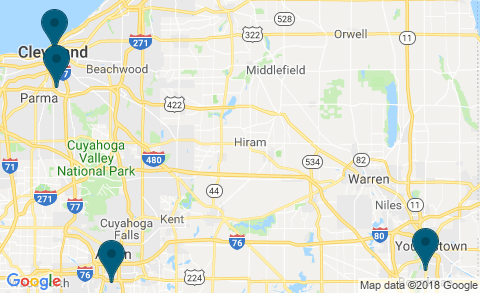 Because of the way they have each handled their respective duties, I would be happy to recommend Ohio Desk to anyone looking for office furniture. In many instances product quality is similar between certain vendors. I’ve found Steelcase’s quality to be consistently superior. Ultimately the employees make the difference. Our salesperson and support group that has been responsible for our installs have been simply outstanding. They are helpful and very conscientious. Knowing the quality and personal support we’ve received makes it very easy to recommend Ohio Desk and Steelcase. I have had nothing but outstanding service from the entire Ohio Desk/Steelcase Team. Specifically, our salesperson diligently works to make sure all issues are handled in a timely manner. It is always a wonderful experience working with the entire group from top management to the individuals installing the furniture. Our relationship with Ohio Desk and Steelcase is the best customer/vendor relationship that we have. I had to use another vendor in the past because of a limited budget. Their product, although less expensive, did not come close to what our salesperson had recommended. The other vendor’s installers were rude and not responsive to our requests. The bottom line is that we ultimately spent more for the product (our time, our labor and additional costs) and still did not come close to Ohio Desk’s recommendation. Our salesperson has been marvelous to work with. She not only knows her product, but is familiar with the sometimes complex requirements of our hospital. She has made my job easier. Our salesperson is top notch – reliable, prompt and courteous. His coordinator is a great backup when he is not in. I enjoy working with our salesperson. He is genuinely interested in helping us find the right solutions for our needs, with our budget in mind. We are certainly confident Ohio Desk offers quality products at a competitive price and installs them correctly. They have handled any issues in the past to our satisfaction. The sales staff is above average in all areas and the installers – none better, outstanding, from the scheduler to the guys that do the installation, what patience in dealing with people, great customer service from them. I wish every company had staff like yours, and I hope you treat them accordingly. OUTSTANDING! I have been dealing with the same sales rep for years and as usual he was great to work with. The different people from my side who were involved in the project were very pleased with the products delivered. Everyone in your office made us feel welcome when we visited. The designer did an absolutely fabulous job! She was a great listener and turned our ideas into great solutions. She made excellent recommendations on items that we were unsure about or didn’t fully think through. I very much enjoyed working with our salesperson and appreciate his help and patience through the process. Our salesperson is wonderful to work with. I can’t think of any way he can improve his service. Ohio Desk has done an outstanding job with all of the projects I have asked them to quote on. Our salesperson was great to work with; he was very knowledgeable of the Steelcase products. It was a pleasure working with such a professional. Ohio Desk sales and service/installation personnel have been very helpful and courteous. They have made several visits to move existing Steelcase furniture, and recommend how to modify existing workstations – and then make it happen. Ohio Desk is professional, courteous and easy to communicate with. Our salesperson is the best. I wish all of my other vendors were at least half as thorough and professional as she is. This was a huge order – Ohio Desk did a great job for us. Our salesperson was awesome. She is detail oriented, understands customer service and is very responsive. She is the hallmark of customer service. We have never been disappointed by Ohio Desk. I have used Ohio Desk many times over the past 10 years and cannot ask for better service, products or installation. Everyone I work with, especially our salesperson, project manager and delivery/installation team are courteous, knowledgeable and outstanding people to work with. I will continue to use Ohio Desk whenever possible and have recommended them to a number of other departments. Our salesperson provided me with the same level of service as if I was a large business. She was very responsive and knowledgeable with National Desk’s product line and layout. She accommodated my schedule to stop by my office to survey and generate a design layout, which was very helpful. She provided me with quality time on subsequent visits to Ohio Desk to insure that quotes and order were correct. Also, the administrator earns my applause as well…very much on top of things and went the extra mile with the delivery of my orders. In addition, the gentlemen who installed my furniture were excellent…great bunch of guys and hard workers. I would be more than glad to recommend Ohio Desk to any potential customer. It has been a continuing pleasure to work with Ohio Desk, from the time the building was built until the present time when we found it necessary to reconfigure some furnishings. The service we receive is exceptional. Everything was above or well above expectations working with Ohio Desk, our salesperson as well as the exceptional installation crew. We made their job a pleasure, as they expressed, by having everything planned, staged, and organized in a clear fashion. They knew were to go with every piece of furniture and exactly where to place it from the master copy. All went well. Thanks for a super job. It was a pleasure to work with everyone involved. I have worked at many healthcare facilities through my 25+ years in Materials Management and every place that we are in need of furniture, Ohio Desk is my first thought to call. I love Ohio Desk. You have the best people working for you, very dedicated and loyal, and are very lucky to have them.